After you have measured your space as discussed in part one, and taken into consideration the construction elements we discussed in part 2, the next thing to consider are style choices and there potential impact on shower construction. Glass tiles are gorgeous and strong, but not strong enough to hold the weight of a glass wall or shower door. When designing your shower enclosure, avoid any plans that involve mounting door hinges and glass clips onto glass tiles. Breakage is likely to occur during or even after installation. This can result in delays in getting the project finished and additional charges from tile installers for repairs. Recommended substrates for mounting frameless shower doors include: granite, Cambria®, Corian®, and tile (Marble, Travertine, Porcelain, or Ceramic). 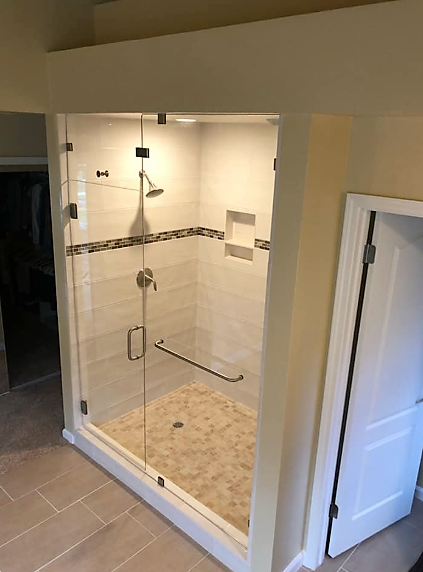 Professional installation of your glass shower enclosure strives to ensure that nothing interferes with the doors movement and that no gaps are left between the door and the wall. Raised decorative tile is beautiful, but placement of tile needs to be considered carefully in relation to your glass shower enclosure. Decorative tiles should not be placed in areas that would interfere with the movement of the shower door, or the installation of a glass wall if possible, because though it is possible to modify a raised tile to allow the door to go over it by applying filler, this can negatively impact how the finished shower looks. Some of these situations can be resolved with a fixed panel design. That way, the door can align with the panel on one side, opening and closing properly with no interference. On the other side, the tile can be notched to allow the panel to line up flush with the wall. It’s important that you position your shower head correctly to minimize the potential for leakage. Don’t place your showerhead opposite the door opening unless you have a low-flow showerhead or one that points straight down to the floor. If possible, make sure the showerhead is directed towards the tiled walls or panels. You may also want to consider where the shower control will be located. If you hate standing under cold water waiting for it to heat up because the controls are directly under the showerhead, try to keep the controls at arm’s length from outside the shower. 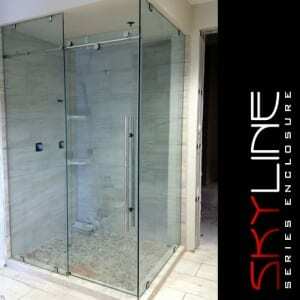 An easy way to achieve this is using a sliding door shower system with bypassing doors. This configuration allows you to easily reach in and turn a shower on to warm it up without stepping all the way into the shower and risk getting wet. 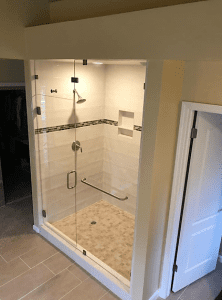 Choosing the perfect shower enclosure for your bathroom doesn’t have to be difficult, use this informative list to help you to begin thinking of plans for your bathroom remodeling project. Discussing the options with a professional glass company can also open up the potential for adding more custom designed and made shower enclosure elements if appropriate.